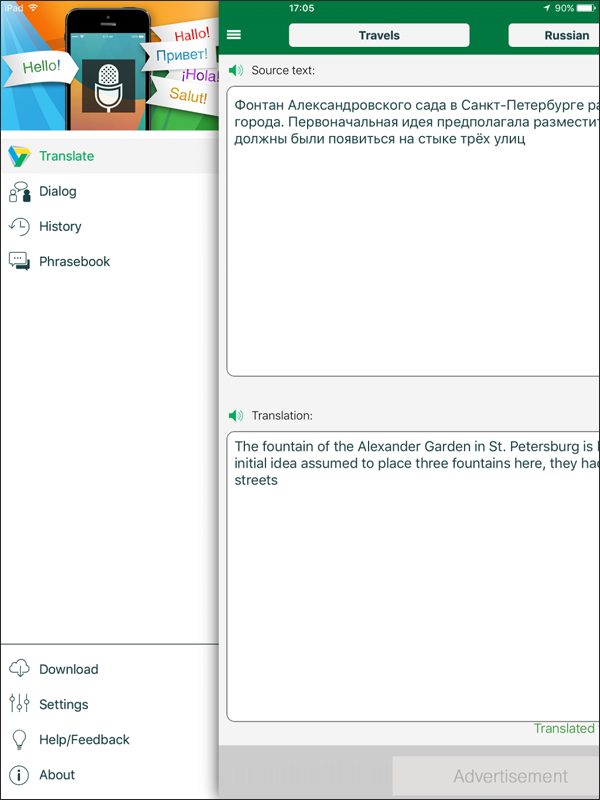 Online-Translator.com app brings translator, dictionary and phrasebook for more than 15 languages to your iPad! 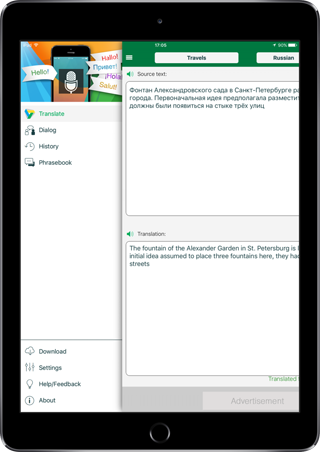 Translate, communicate, and learn foreign languages with Online-Translator.com for free! Four years in a row, PROMT gets the highest marks from the experts of the Association for Computational Linguistics (ACL) for automatic translation from English to Russian. 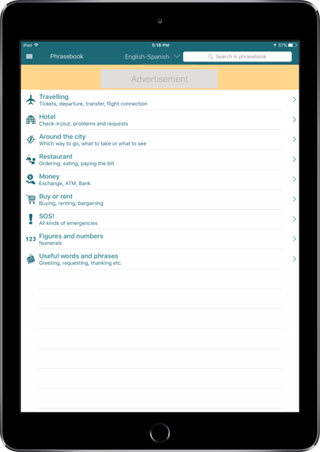 The app has already been customized for the most popular topics: education, messaging, social media, traveling, restaurant menus, health, sciences and humanities, business, and many more. Choose the topic you need, and enjoy high quality translation. 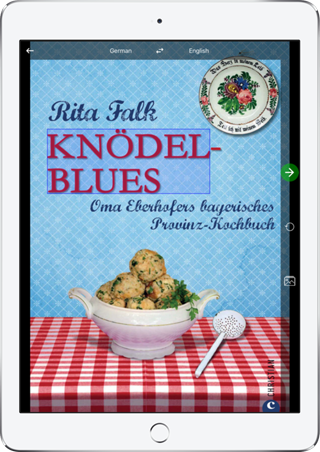 And thanks to modern design specifically developed for iPad, Online-Translator.com is really easy to use! Would you like to ask a local for directions? Let the waiter know about your food allergies? Find out the bus schedule in a provincial town? Or just start a small talk in foreign language? Our new Dialog mode makes these tasks much easier. Choose the language and the topic you need, and engage in conversation! Text and voice input modes are available. All you need to do is to take a photo or to choose from the gallery an image containing text, and in a moment you will get the translation. 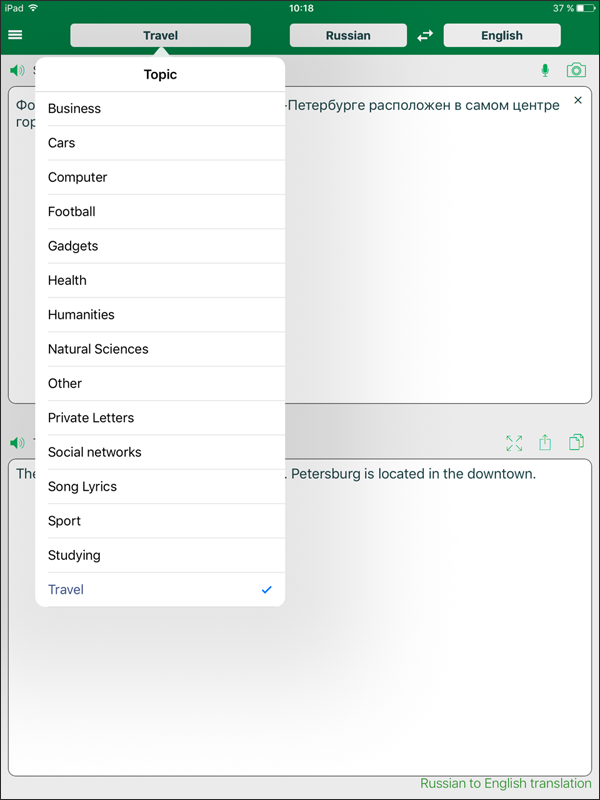 If you are translating a menu, choose Travels from the list of topics. It is designed to help you in the most frequent situations you encounter abroad, including visits to cafes and restaurants. 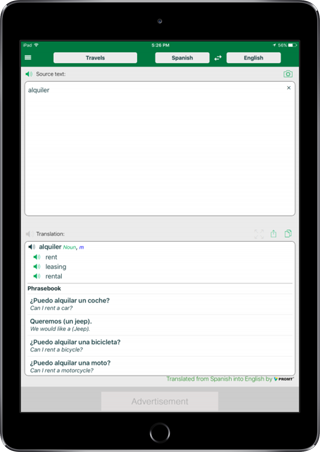 Configure a widget for the Today screen for instant translation of the clipboard. 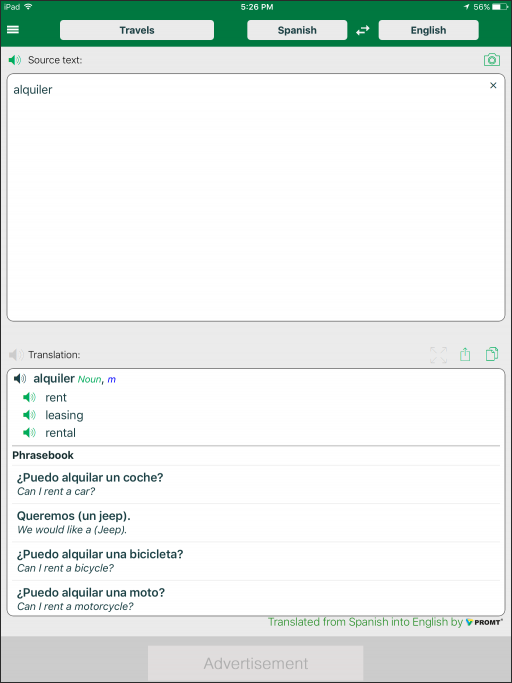 Use the Share to translate a text or a link from other applications. Using the voice input, just say a phrase you need to translate, and find out the pronunciation of its translation. 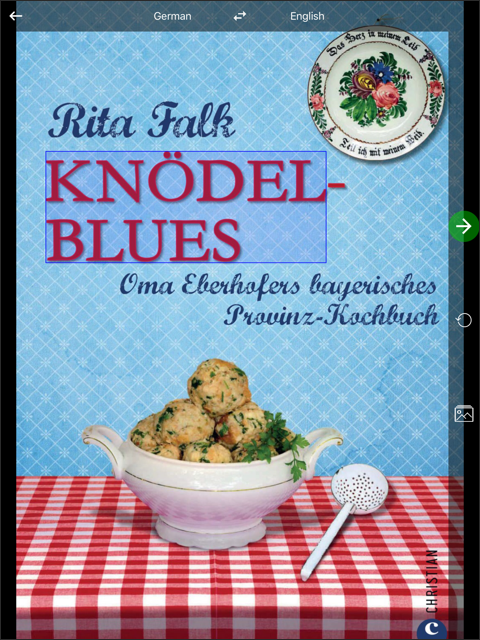 You also can listen to the pronunciation of a phrase from the phrasebook. Learn foreign languages easily and effectively! Use the app and discover more than 15 widely spoken languages: English, German, French, Spanish, Italian, Portuguese, Japanese, Finnish, Arabic, Turkish, Greek, Catalan, Kazakh, Chinese, and Russian. Quickly look up variants of translation, transcription and useful grammatical clues. 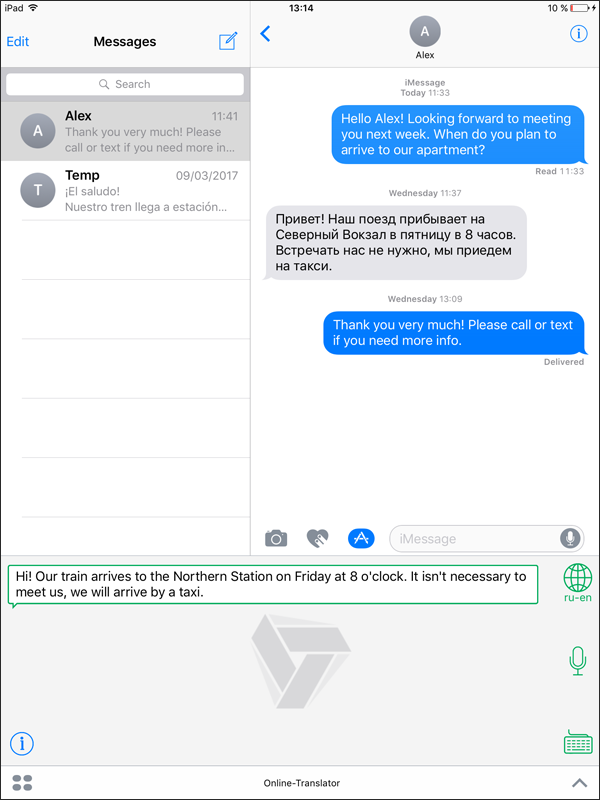 Try out our Plugin for iMessage! 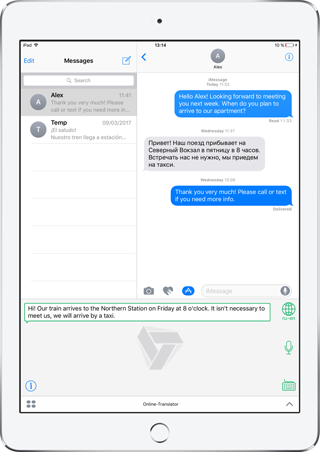 Enable our plugin for iMessage and speak to your friends across the world! Type in your message or say it out loud – and the plugin will instantly recognize the language and translate it. 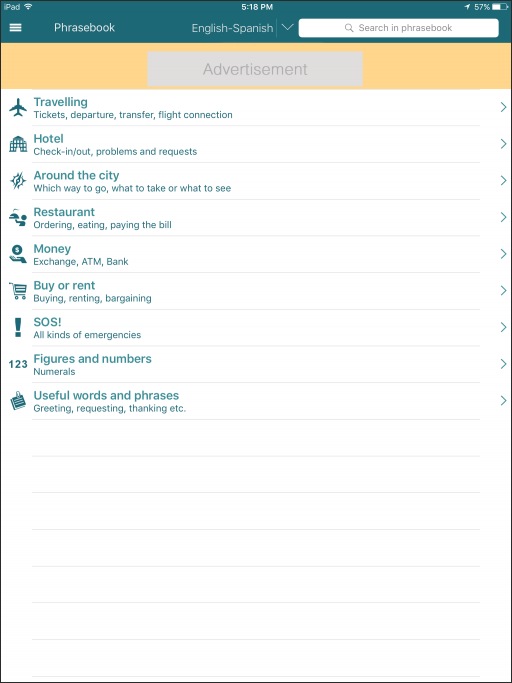 Download the most important phrases for any situation in your journey and communicate with locals all around the world. Don’t worry about language barriers and extra spending! 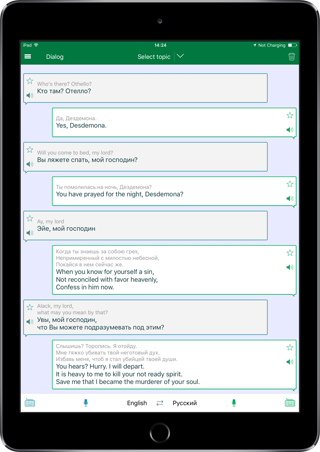 An Internet connection is not required to work with the phrasebook. When traveling abroad, turn on traffic minimization mode (disabling some of the options), which helps to reduce considerably mobile data consumption while using the app.